Despite BMW Korea’s measures including a recall, checks and lease services, more owners of a problematic model that appears prone to catching fire are taking legal action against the automaker, this time joined by a local consumer protection group. Marking the first consumer protection group to take action since the series of BMW fires, the Korea Consumer Association said Monday it is preparing to file a lawsuit against the German luxury carmaker with about 100 members of a BMW car owners’ club. It will recruit more plaintiffs in the following weeks. Last month, four BMW car owners, represented by the law firm Bareun, sued BMW Korea and five official dealers including Dongsung Motors, Handok Motors and Deutsch Motors. This was followed by a second group of 13 BMW owners taking similar step last week. Memberships of an online cafe called “BMW fire victims’ class suit” doubled over the weekend to 6,891 members as of Monday, from about 3,000 Friday. “Owners of recalled vehicles are under immense mental stress running their cars, as it is difficult to receive repairs at overloaded BMW service centers, while they have also received financial harm due to a plunge in the used car price,” the KCA said in a statement. Law firm Heon, representing the KCA and the 100 BMW owners, is currently working with plaintiffs and advisers on details of the lawsuit and compensation, the law firm said. According to the KCA, some 30 professionals, including automotive professors, lawyers, former employees of the National Forensic Service, technicians, and mechanics among others will be offering advice throughout the process. Following the engine fire over the weekend of a BMW 520d that had undergone a safety inspection, BMW Korea found itself under pressure from the Ministry of Land, Infrastructure and Transport to transfer additional documents to investigate the possibility of other faulty parts or systems. “BMW recently transferred technical documents related to exhaust gas recirculation, but we see this (documents submitted) to be insufficient. We have asked for additional documents on parts that have been mentioned as possible causes for engine fires,” the ministry said. Given that BMW uses the same EGR in all 520d sedans and recalled vehicles sold in other countries, auto experts have raised the possibility of other causes such as software or faulty intake manifold. 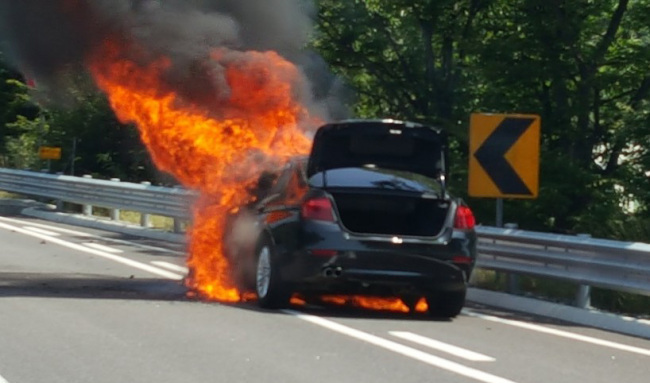 Further fueling anxiety, a BMW 520d sedan caught fire Saturday in South Jeolla Province after receiving a safety check last week. The number of BMW vehicles that have caught fire stands at 32 units so far this year. BMW Korea voluntarily recalled 106,317 units of the 520d sedan and 41 models due to a faulty EGR module on July 26. Last May, BMW recalled 294,000 vehicles in the UK over the possibility that the wiring harness connected to the heater might catch fire, affecting all 3 series cars manufactured between December 2004 and July 2011. Meanwhile, sales of the BMW 520d halved to 523 units last month in comparison to 963 units sold in June, according to figures from the Korea Automobile Importers and Distributors Association.